← Funny Names All Over at the 2014 Oscars! On some level, we all want to be recognized, make a name for ourselves. Hervé This has done just that. 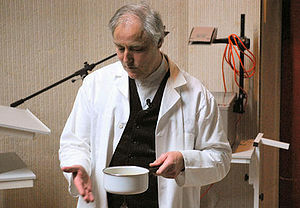 Our man This goes down in history as The Father of Molecular Gastronomy. a subdiscipline of food science that seeks to investigate the physical and chemical transformations of ingredients that occur while cooking. Culinary physics, if you will. At its most basic, molecular gastronomy is kitchen sci fi: Making meringue in a vacuum chamber, cooking sausages by connecting them across a car battery, microwaving reverse baked Alaska (hot inside, cold outside). 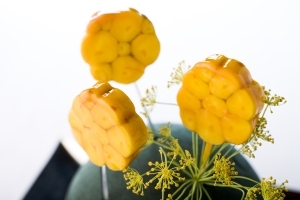 Then there’s the Octopop: a low-temperature cooked octopus fused using transglutaminase, dipped in an orange and saffron carrageenan gel and suspended on dill flower stalks. Huh. Monsieur This clearly ushered in a new age by opening the molecular gastronomy door. Born in 1955, he graduated from École supérieure de physique et de chimie industrielles de la ville de Parisand (whew!) and earned a Ph.D, titled “La gastronomie moléculaire et physique,” from University Paris VI. He’s written oodles of scientific publications, as well as several books on the subject, which are said to be understood even by those not fluent in chemistry. As French physical chemist at Institut National de la Recherche Agronomique at AgroParisTech, This and research partner Nicholas Kurti (now deceased) coined the term “Molecular and Physical Gastronomy” in 1988. More recently, it was shortened to molecular gastronomy. This’s resume is mind-bogglingly impressive and if French academic name dropping isn’t your thing, you’d best skip down a paragraph or three. But for those who want it all, know that This is a busy man. He collaborates with Pour la Science, a magazine that introduces scientific concepts to the general public. He’s also a corresponding member of Académie d’agriculture de France and scientific director of Food Science & Culture. In 2011, he was elected as Consulting Professor of AgroParisTech and asked to create science and technology courses at Sciences Po Paris. Some of This’s discoveries include the perfect temperature for cooking an egg and smoking salmon via electrical field. Every month he adds one new “invention” to the Art et Science section of Chef Pierre Gagnaire’s website. Although his main focus is physical chemistry, This also greatly credits the emotional aspect of cooking, hence his book Cooking: The Quintessential Art. So much more can be said about this extraordinarily brilliant man, but I’ll leave that to those who want to dig further. For our purposes, we’ll leave it at thanking Hervé This for his lovely French name and for having so much molecular fun in his kitchen laboratory. This entry was posted in funny names in food, funny names in science and tagged cooking, deLizious, Hervé This, humor, humour, molecular gastronomy, Octopop, science, scientists. Bookmark the permalink. Wow! I’m loving this post. Herve seems like my kind of guy! And Liz’s kind of guy! Who else meets those two criteria? thought this post would float your boat, Dave. He seems like a fun conversationalist for sure. So bright! And what a passion for food, cooking, etc. Thinking there should be a movie about his life. You’re living closer to Hollywood than I–can you make this happen? Also, seems congratulations are in order. Yay, you! Have you picked a program? To answer your question, I just did this weekend. Unless I’m accepted by UCSD off the waitlist, then I’m going to be attending Case Western in Cleveland. It’s hard to turn down a top 25 med school. Awesome!!! I’m doubling your salary this month! 😉 Well done Liz. Even without the awards, your contributions are highly valued, but it’s great to have some tangible recognition of your awesomeness! At first I thought Herve This was an invitation to eat something. Then I thought it might be a threatening kind of imperative (like “analyze this”). It only slowly dawned on me that it was . . . a name!!! The find is as good as the post itself. Thanks, diddy. Will admit to it being an awkward post to write what with the pronoun/proper noun thing going on. I’d want to write “this,” but wonder if it sounded like “This,” vice versa. Dilemma. AND I realize that French folk will find nothing funny about the name at all. For all I know, Hervé This could be my John Smith. But all in all, fun find and I owe it all to you and your persistent search for funny names. You inspire me to look under those rocks, climb those pea shoots (what? I wasn’t supposed to climb them? never mind…) And I found myself a doozy who is brilliant with food. What’s not to like? I refuse to take credit for your intrepid name hunting! That is, I refuse to take credit for This! You alone deserve credit for This! You should not be so modest about This! You should be proud of This! All I can hear is Faith Hill singing “This Kiss, This Kiss,” and I in no way would want to kiss Mr. This. Oh, there’s another song by Aaron Tippin, “Kiss This.” Yeesh. Sorry. Anyway, I nominated you for The Seven Awards: http://sanceau.com/2014/03/04/seven-minus-six-awards-post/. However, I did not obey the rules bc I did not get my requisite coffee today bc we ran out of creamer yesterday, and I’m skittish, so I gave you no template from which to work,making it difficult for you to accept or renominate. So there–I spared you the duty of an awards post. 🙂 P.S. A chef with “gag” in his name does not make me want to eat. Now, Kerbey, you’ve taken this post to places I never even imagined it’d go! Which is why you’re always welcome here 🙂 Never saw that “gag” in Gagnaire (because he is such a fine-looking Frenchman: http://www.pierre-gagnaire.com/#/pg/pierre_et_herve ), so I would eat anything he prepares for me. Okay, you can call me K. I think you feel about Pierre as I feel about Curtis Stone. Curtis Stone is the chef who makes cereal seem delicious on several levels in that Post commercial, right?! You mean the one where he cups the bowl gingerly and softly brings the spoon to his supple lips, that one? The one where his shirt should be off? And the wind is gently caressing the wheat fields the way my fingers should be gently caressing his sculpted cheekbones? That one? Oh my yes. Heating up in here, ladies. Can someone please open a window? And why this sudden craving for cereal? You crack me up. I think we just wrote a Harlequin novel. This is the best, Liz. I mean this post, but also Mr. This. Both the best. I don’t know what’s going on with the reverse Alaskas and octopus popcorns but they sound delicious. Cooking sausages via car battery is also a handy survival tip for that time you’re stuck in the wilderness with some sausages and a functioning automobile. Gotta jot that one down. Oh, thank you, Arto! Am glad you picked a survival skill up here. BoFN can be so very many things. Seems a cool guy. And I love what he does, though would be hard pressed to truly follow any of it. But I appreciate that he thinks like he does so he can be brilliant for the rest of us. Hey gang, how about a naming frenzy for family of Prof. This? First, there’s his wife, Anna Liza This. That works as my middle name is Ann, so it’d be like we were reverse French/American twins. Name game aside, I want to learn more about this guy. Would love a documentary. What led him down his path? Was his mom an amazing cook? Does he sit down to burgers and frites for supper? Do his kids (if he has any) eat cold cereal in the morning? Or maybe he’s at the lab all the time and rarely sees his family? His Australian cousin, Troy This. Haha, Anna Liza This. I love when you come up with things that never would have crossed my mind. Brilliant stuff! Thanks! I was hoping for a dog pile there because I couldn’t do much more with it. Darn it, that last name “This” just sitting there, waiting for more name possibilities, and no more jokes? Untapped funny potential can be frustrating! Reid This? I. C. This? Liz !!! My Corporate Hamsters are off their wheels this afternoon, so I can’t stay long, but I just had to stop by and tell you that I love this … post. Teeheehee. Such a good one !!! I am so curious about the perfect temperature for an egg, and will be googling up a storm when I get home tonight! Sorry to hear about the Corporate Hamsters (can we call things chamsters to save space and because it’s a cool word?). The This is confusing indeed, but therein lies all the fun. Can save you the googling: http://www.cupblog.org/?p=572 Though Bon Appetit just ran a brilliant feature on what you want for different applications (salad nicoise vs ramen etc), which I can scan and send. octopop looks stunning but i would use it as a centerpiece rather than a food item. you go, herve! and this great post reminds me of alton brown, who loves to combine his science with his foodie skills. am an AB fan myself, Beth and yes to the similarities. Those this guy (aka This) takes it another level. Wouldn’t be surprised if they’re friends or at least colleagues. A stunning centerpiece, but it would get smelly pretty quickly (unless that carageenan stuff is acting as a preservative or shellacking kind of thing). Be sure to switch it out between dinner parties. Alton was the first food guy I ever followed. Fun fact: Rob used to watch a LOT of Food Network, and introduced me to Alton and most of their other chefs. Liz. Liz. I often feel so out of my league here. Today, yup. Totally. Awesomeness – that’s obvious, I just can’t find the words to say how I know that. I just do. Here’s to Awesomeness here there and everywhere! Wow, Liz, sorry I’m a day late, something went wonky with my reader. Great post on so many levels. Trust you are all better? Yes, I love the sciencey aspect for sure! I really wanted to play that name game with you, diddy, so much so that I started doodling good first names for This before a client meeting this morning, but then here I am at the end of the day with nothing except for I. Reid This, U. Reid This and U. C. This. Not exactly top-grade work. Sorry! Though I did have one original name: Faelin This. This is a tough last name to match. Yeah, me too! This was so much tougher than it looked like it was going to be! What trips us up, I was thinking, is that last names are often ordinary words too but first names almost never are. Liz, I forgot to mention that if you make octopops, I will book a one-way flight to your kitchen to taste those magnificent-looking morsels! good to know! What if I gave amb the recipe? … then we’d both book a one way flight to your kitchen, Liz! I think we may have just found the limit of my love for Dave. Babe, you know I’d do almost anything for you … except cook octopus. xo. It’s even better on rereading! Hmm . . . real science. It’s so crazy it might even work! Proving that you can Hervé your cake and eat it, too! brilliant, Diddy! Love the Hervé pun and you even added cake. Will admit to being no good at faux fighting. I’m convincing enough until the “real me” comes out and starts saying how much I love or like or enjoy something. Am rotten like that. Hey Liz, remember the song “Kung Fu Fighting”?